ArcSafe wet weather gear is a complete protective garment system from Elliotts that safeguards the worker against multiple risks including flame and arc flash while working in rainy conditions. Workers in the electrical industry are often exposed to hazardous and potentially dangerous workplace conditions while working outdoors in the rain. The Zetel ArcSafe wet weather apparel was specifically developed by Elliotts to provide Australia’s leading solution for the protection of workers against electric arc flash in wet weather conditions. Several modifications have been made to the components and construction of Zetel ArcSafe wet weather apparel to enhance its performance with the ATPV rating improved from 8.9 to 11.0 Cal. Zetel ArcSafe wet weather jackets and trousers were recently tested by Kinetrics Laboratory in the US to ensure they met the highest possible standards required by electrical workers. The ArcSafe jacket and trouser passed the test, proving their superiority in the Australian arc flash wet weather gear market. ArcSafe wet weather gear from Elliotts is available in two options: ArcSafe wet weather gear providing HRC2 level protection in a full waterproof wet weather jacket and trouser, and ArcSafe GR FRAS (Flame Retardant Antistatic), which additionally features an interwoven carbon grid to provide antistatic properties to the ArcSafe garment. Zetel ArcSafe wet weather clothing offers increased hazard specific protective performance to address specific needs in the electrical utility industry for Australasian conditions. 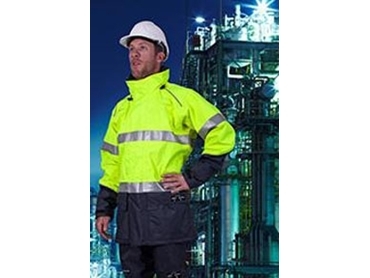 Zetel ArcSafe clothing is highly visible, waterproof, breathable, windproof and flame resistant, offering protection against electric arc hazards. The Elliotts specialist ArcSafe wet weather gear offers options for all industries and protection levels required to keep safe in any wet weather situation. Elliotts is an Australia-based designer, manufacturer and distributor of world-class quality safety gear servicing the Australasian market with specialist safety apparel, welding and workshop protection, gloves and hand protection, safety workwear and PPE for workers across several industries.